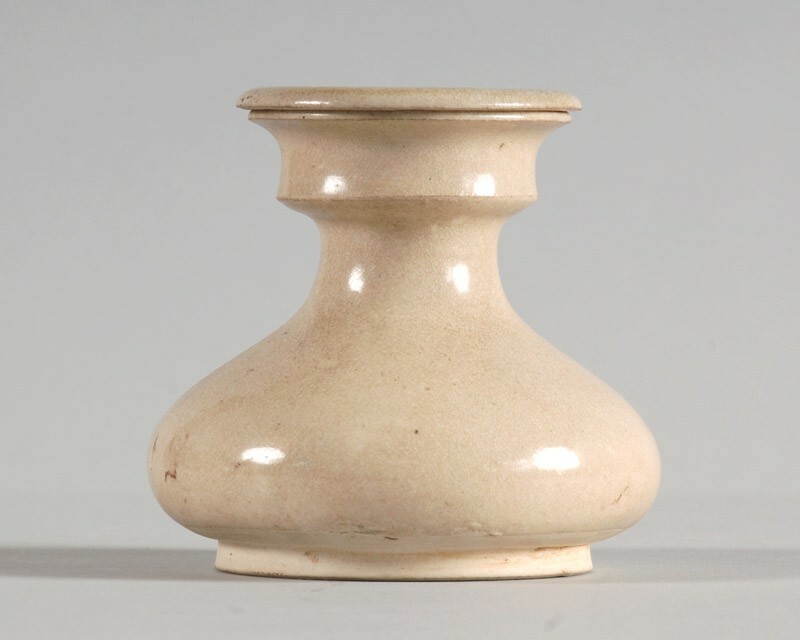 This distinctive shape, with the sunken cover, is characteristic of the Sui dynasty, as is this fine white stoneware. 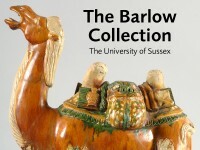 The Barlow Collection also holds a contemporary tomb figure of a female attendant holding a jar of this form, [LI1301.396.1 and LI1301.396.2]. The piece is finely potted, of broad pear shape, resting on a wide, slightly tapering, nearly solid foot with broad shallow footring. The slender neck is opening into an angled, cup-shaped mouth with flared rim. The cover is made in corresponding shape, fitting over the rim of the jar, with a pointed knob in the sunken centre. The cream-coloured stoneware bears a transparent glaze with a greenish tinge and a dense crackle, which leaves the underside of the cover and lowest part of the sides, including the base of the jar unglazed, where the smooth body is visible.